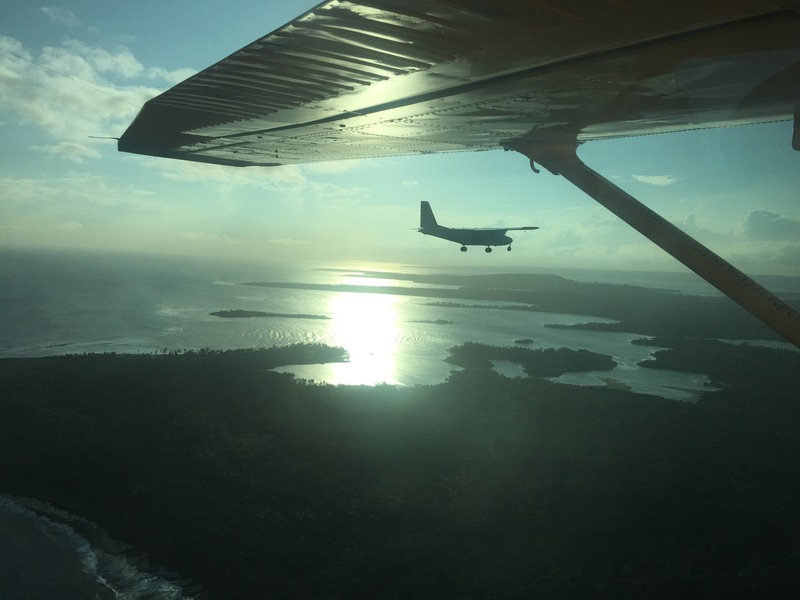 After our evening flight from the Solomons, we landed in Port Villa in Vanuatu – a last minute addition to our trip due to Fiji airways changing our flights. It was already dark when we got in so we got a short taxi to the hotel, checked in, had a few drinks and snacks and went to bed. We were up early in the morning (Easter Sunday) for our day trip: to see an active volcano!!! All excited we polished off some free breakfast and waited for our pick up. We were taken back to the airport and checked in for our flight to Tanna island. We knew we would be on a small plane but we didn’t realise just how small: a 6 seater Cessna 206 built in 70s! The pilot gave us a safety talk and we climbed in. Mike and I at the back, a couple in front of us and Mike W next to the pilot! The plane lifted off as if a feather and climbed to 7500 feet. It was a smooth ride and offered some excellent views of the islands and the beautiful blue coral sea as we went by. 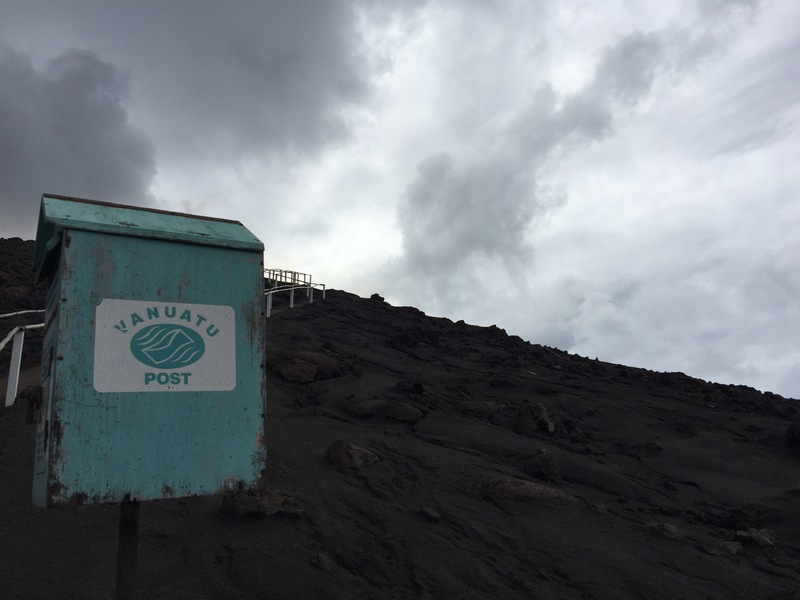 When we reached Tanna, we flew to the back of the island where Mount Yasur (the volcano) was. We could see the iconic dome shape when suddenly it exploded and sent a plume of yellowish ash into the air! 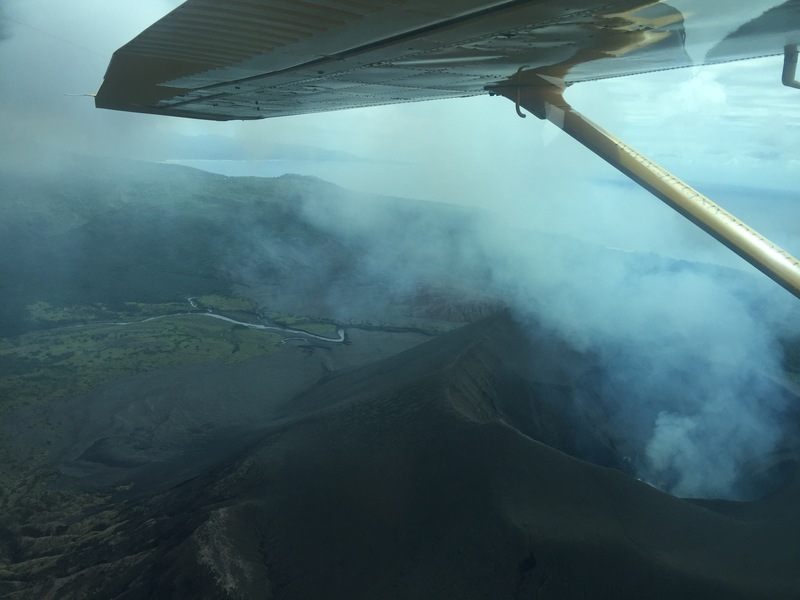 The pilot banked and swung around the volcano and looking down we could see smoke and the red glow of lava. I expected some smoke but nothing like this. After a another gforce turn we crossed back over the island and landed at the airport. A bit of a sidewards landing and a bit of a bump but we were down. The pilot (Paul) parked on some grass and we all hopped out exhilarated. We would of paid for just the flight alone as an experience but the best part was yet to come. Next, the three of us, sat on some home made seats in the back of a pick up truck and began our hour and half drive across the island. No direct road, so it weaved across the island to the coast and around a mountain. The breeze was nice as the sun beat down and we caught up on some tanning on the back of the truck. An hour into the drive we finally glimpsed the volcano again. But this time from a different angle. Again the classic shape could be seen and smoke could be seen rising out joint he cloud above. 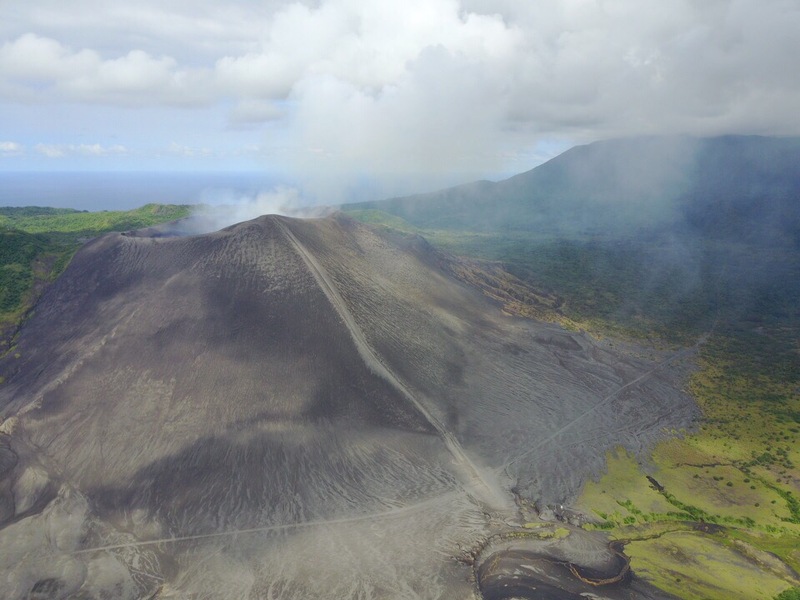 From this view the black ash/sand made up the entire side and area below the volcano. Selfies done the drive continued. The road ended and we drove on dark black soil. It almost looked like (and maybe was) an old lava flow had carved a path through the rainforest. Soon we drove through a river and could see where the river had eroded away the banks the layers of ash from previous eruptions. The landscape was striking, especially where he river had carved its way through to leave stacks and banks of black earth. The truck then sped over flat black plains, avoiding large holes and crevices that had formed. We jumped out when he stopped and you could instantly feel the volcanos power. The eruptions were loud and made the earth shake even though We were still half a km from the base. Mount Yasur rose up to about 600 or 700 metres. Higher than the drone could (legally) fly. As mike flew the drone around and took shots of the stunning landscape. Another batch of pictures done and the drone landed we drove for 10/15 minutes to the other side. Here the tropical rainforest climbed up the side of the volcano. At the base we pulled into a small ‘camp’ and were welcomed by our volcanic guides. After a quick mosquito filled toilet stop we transferred vehicles and climbed the slope. Bumping around the back, the track was lethal and not something I would want to drive. It took a good 15 minutes through the rainforest and suddenly the flora ended and the ash returned. The explosions were even louder here and more frequent. We parked in a make shift car park and walked the rest. After 10 minutes of climbing we reached the crater edge, stopped and took in the incredible sight. With every eruption came a cloud of yellow smoke and pieces of red molten rock flying in the air, hundreds of feet up. They landed back in the crater and luckily where not shooting out in different directions. The volcano was at level 2 out of 5. We asked what level you still come up to the top and where gold level 2. Level 3 lava bombs would be where we were standing. Level 4 and the local area is evacuated. Level 5 you stand no chance! So we had arrived at the perfect level. The volcano exploded every 2/3 minutes send lava bombs and smoke high into the air. The ground shook with each one. 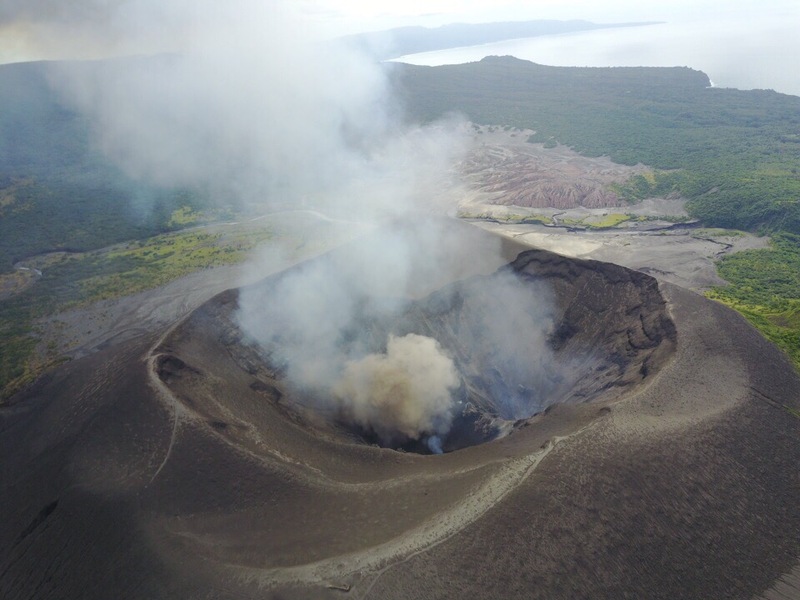 The crater wasn’t just one hole filled with lava but 4 small vents inside the crater. From the where we stood couldn’t see the vents like the airplane but we could sure here, feel and smell them. Every so often a strong smell of sulphur filled the air. We spent around 40 minutes at the top looking on in amazement at the power of Mother Nature and Mike even risked flying he drone. Lots of wind, magnetic interference and compass issues but he flew it well and got some great areal shots. Mike didn’t like the height of the volcano or the huge crashes and bangs it made and wasn’t impressed when he was packing up his drone I shouted ” look out” and he ran for cover holding his hands above his head! We headed down to the car park and noticed peculiarly a post box on the side of the mountain that was apparently filled daily! It had to be the most dangerous post box in existence. The van bumped down the slopes through the jungle and we arrived back and ate some lunch. We did our trip in reverse and arrived back at the airport. However the plane needed putting back on the run way so the 6 of us pushed our plane in to position, another first! It was intact very light and easy to manoeuvre. This time I got to sit next to the pilot! I got to wear special earphones so I could talk to the pilot! 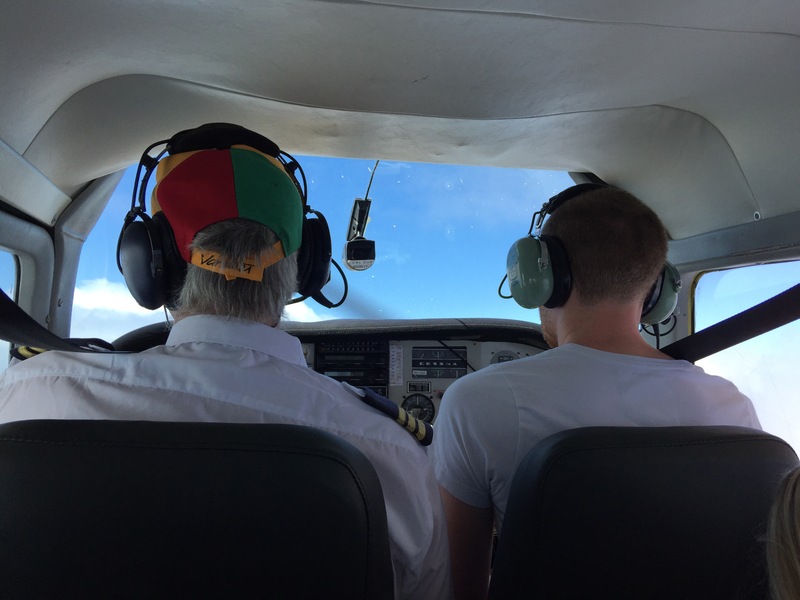 As I was in the co pilot seat their was a steering wheel between my legs and controls at my finger tips. I didn’t touch any controls and sat as still as I could- for fear of touching anything. We took off and travelled back at a much lower altitude of 1000 feet. Below the clouds and (just) above the sea. The other plane with the tourists from the rest of our group flew alongside making for some good photos. The pilot requested some photos to be taken for his album! After a smoother landing and exchanging details with pilots we headed back to the hotel. We headed out into the town and found something to eat. Most things were closed with it being Easter Sunday but we found somewhere nice for dinner and then drinks after. The following day we checked out and hung around at the pool next door (as our hotel pool was under maintenance). After swims and food we headed for the airport for our flight to Fiji (only to be delayed 5 hours! ).